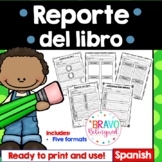 This is a book report for students to use after reading a book during work stations, independent reading or guided reading. It can also be used after a mini lesson for a whole group activity. Este paquete contiene diferentes reportes de lectura ó reportes de libro que se pueden utilizar con los estudiantes, ya sea de forma independiente, en grupo ó en estaciones de trabajo. This graphic organizer helps students identify story elements for fictional text. Good to use after independent reading to monitor comprehension. 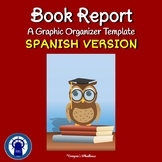 Students will use this book report to inform their friends about the book they read. 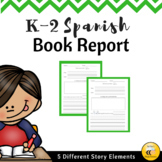 Book Report English and Spanish! 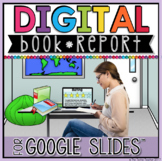 Great book report for students to complete after their reading. Can be used in Daily 5, Literacy Stations or as Homework. Hope you enjoy it! Don't forget to rate this item! Reading: Literature 3 Key Ideas and Details RL.K.3. Identify characters, settings, and major events in a story. After reading, label and draw the main character and the setting of the story. You know the disguise a turkey project? Well, I changed it around a bit! Instead of disguising your turkey however you'd like, read a book with your family, talk about the main character and then disguise your turkey as the main character of your book!